AMS's Dr. Becky Fraser on why she thinks that '12 Years A Slave' deserves to triumph in the best picture category at the Academy Awards on Sunday night. If this year’s BAFTAS is anything to go by then Steve McQueen’s 12 Years A Slave should walk away with the coveted prize of Best Picture at the Oscars on Sunday night. There are other contenders of course, American Hustle, Dallas Buyers Club, Gravity, and Philomena to name but a few. Yet, the story of Solomon Northup, who lived as a free coloured man in New York, subsequent to his kidnapping and sale in the slave market of New Orleans, raises troubling and awkward questions about the American past that this film demands answers to. McQueen’s retelling of Solomon’s story is a brutally honest and beautifully tragic depiction of the lives of enslaved people in the American South. The small number of Hollywood films which have previously attempted to depict American slavery have either raised historian’s ire because of the historical inaccuracies and lack of authenticity or else have skirted around the vicious realities of the system in favour of representing white male heroes who launch a one-man campaign in the name of abolition. What McQueen does in this film is breathtakingly honest in terms of the historical truths it tells and the faithfulness it retains to Northup’s original narrative. The film pulls no punches with sadistic violence from almost the very outset. Yet, this, in reality, was what many (if not all) enslaved people experienced and witnessed on the plantations, farms, urban and industrial environments in which they lived. The true horrors of slavery are laid bare for the viewing audience to witness and voice long after the film credits have rolled. Indeed, this is one of the most important aspects of McQueen’s film. The power of the film however lies not just in McQueen’s skilful retelling of its narrative, but in the narrative itself. Once Solomon escaped the torment of slavery through eventually getting word to his white acquaintances in the North who confirm his identity as a free men, he leaves the slave south and returns to his family. This could have been the end of it. An experience never retold. Yet, Solomon actively bears witness to his experiences through his narrative published in 1853. Campaigning on behalf of those still enslaved on North American shores, in order that the crimes he witnessed and indeed experienced himself – the severe whippings, brutal rapes, gratuitous violence, and psychological anguish – were given voice by one who was able. While the violent realities of the film are immediate, I was also incredibly struck by my emotional response to the film. As an historian of American slavery, with a particular focus on the experiences of the enslaved, and having read countless slave narratives over the years, I credited myself with being able to distance myself from Hollywood depictions of the ‘peculiar institution’. Yet the poignancy of the scenes in the film where the startling and shocking are narrated as the mundane and everyday left me weeping: the deadness of the slaves’ eyes, waiting in the New Orleans’ auction house, as Solomon passes them in the steam ship, the trading of marketable human property as prospective buyers examine Black bodies; the enslaved parents parted from their children, husbands separated from wives, networks of kinship decimated as families were torn apart; and the struggle – often in vain- to retain a sense of self amid the inhumanity of the system. Many are used to understanding American slavery as a relationship between the oppressed and the oppressor: the master/slave dialectic where the southern master is always the epitome of evilness and the slave, the pitiful victim. 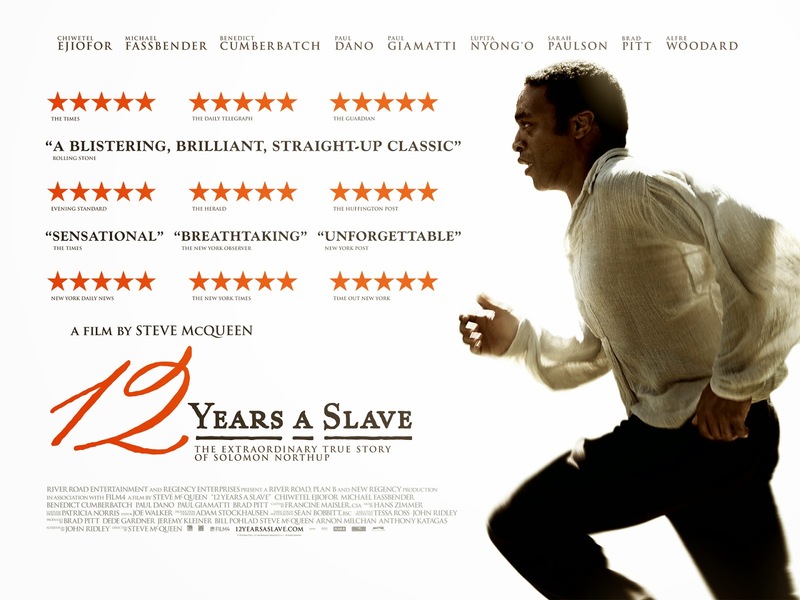 12 years A Slave rightly challenges this one-dimensional image by exposing the complexities of this slave system and revealing the ways in which various historical actors managed their relationship to that regime. For example, the viewer sees two extremes of mastery with Ford (played by Benedict Cumberbatch) as the more benign, almost reluctant, slaveholder who seems to view his slave labour force as something more than human chattel, placed in contrast to Edwin Epps (played brilliantly by Michael Fassbender) the almost caricatured vicious and malignant master who indulges his violent and perverse pleasures on his enslaved workforce, most particularly Patsey. Furthermore, Mistress Epps (Edwin’s wife, played by Sarah Paulson) is viewed by the audiences as being complicit with the slave system, wholly aware that her wealth depends on it. Mistress Epps’ violent punishments on Patsey, who is subject to Epps’ nightly sexual abuses, is both horrifically raw and yet somehow strangely normalised. Northerners and the northern states too play their part in Solomon’s narrative: he is invited from New York to D.C with the probable original intention of kidnap. Yet he also owes his eventual redemption to residents of the state of New York. The enslaved too are represented with active agency of sorts, although many will beg to differ with me on this point. Although no insurrections are mounted nor attempted or actual murders of their masters are plotted, (so no outright “resistance” is achieved) enslaved peoples are depicted as at least attempting to retain a sense of dignity and personhood beyond that of “slave”. Examples of this are fewer in the film but are at least evident. For example, Solomon’s gifts as a violinist and the consolation music afforded him and others; the deliberations in the slave quarters over the rights and wrongs of masters and their ultimate purposes in owning slaves; and Solomon penning his own pass as many enslaved people would do if they had somehow learned to read and write. When reflecting on the experiences of the enslaved under the pernicious rules of Southern racial slavery, it’s particularly important to broaden our concept of what resistance is, moving away from a grand gesture of political overhaul towards acts of everyday survival that enabled the enslaved to at least live under the harshest of adversity. This is, in part, what McQueen does so well. One might ponder why it was Solomon’s narrative that made it to the screen – why, for example not the more famed Black abolitionist Frederick Douglass, formerly enslaved in Maryland; or the story of Harriet Jacobs, enslaved in Edenton, North Carolina, where she escaped the brutality of her master’s sexual advances, feigning escape by hiding in her grandmother’s attic for seven years. Yet, the fundamental importance of this story is without doubt – it was made with hope perhaps that in future years audiences will hear the voices of other enslaved peoples, their experiences too being retold on the big screen. McQueen’s film ultimately makes the fundamental point that 12 Years A Slave is not just a story about slavery or the American South; rather it is an American story that needs and demands to be heard by all. Let’s hope the credit it so surely deserves is awarded on Sunday evening. Containing Multitudes II is an introductory survey module that presents students with the broad outlines of American history from the end of the nineteenth century to the present day. It follows a chronological sequence with weekly topics on the major themes and events in U.S. history since 1890. 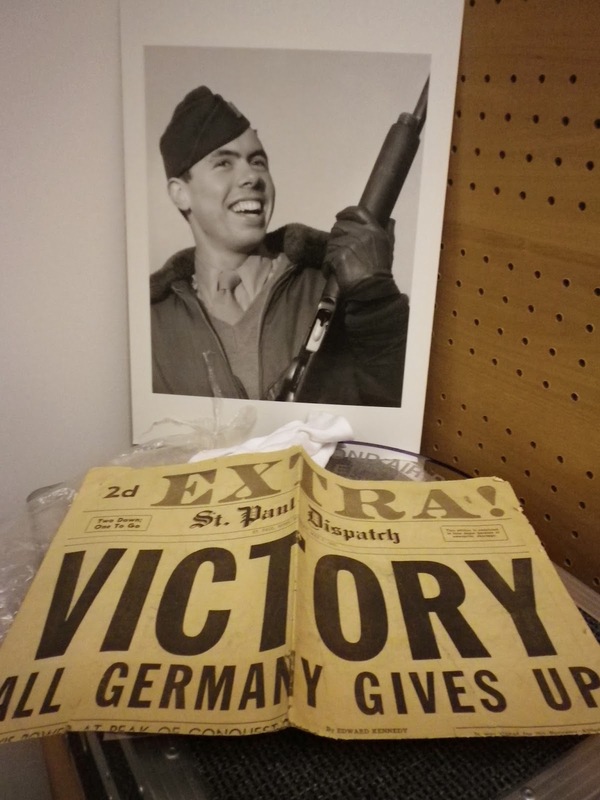 During their week on the Second World War, the students from the Containing Multitudes module visited the 2nd Air Division Memorial Library in the city centre to explore some of their archival material and secondary sources relating to the Second World War. The Memorial Library was built in commemoration of the nearly 20,000 American airmen of the 8th Air Force who served in East Anglia during WWII. As such, the library archive, on deposit with the Norfolk Record Office, has access to personal papers, diaries, photographs, wartime newspapers and magazines, informational pamphlets issued by the U.S. Government and other wartime memorabilia specific to those who served in Norfolk and Suffolk. 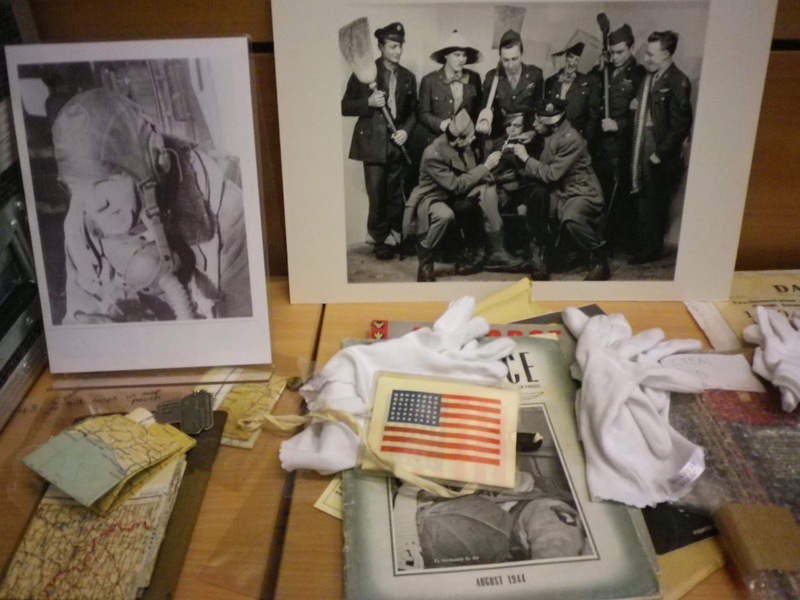 Making use of the library’s primary and secondary sources, the budding historians were able to study, contextualize and analyze the various ways that the war impacted the everyday lives of Americans both at home and abroad. With a multitude of resources at their disposal, each student was left to independently select and research two primary sources of their choice and then present and decode them for the rest of the class. Focusing on war time ads, posters, art and propaganda, some students examined how support for the war was mobilized and how gender, race and national identity was written, coded and read into many of these wartime ads. Stepping away from national wartime rhetoric others chose to reflect on the ways in which the war affected specific individuals. Appropriately, these students focused on eyewitness accounts, letters from soldiers to their families, diaries and memoirs. Still, others were keen to research the way the war affected specific communities, like women, children and people of color. Finally, some were more interested in the specific experience of the Americans serving in Norfolk and the local communities that received them. Having examined material that was produced by the American citizenry and U.S. government during the period of study, the students were offered a unique perspective into the individual, domestic and international consequences of the Second World War. Additionally, the students gained an important opportunity to put their organizational and analytical skills to the test by assessing the primary sources from that period. 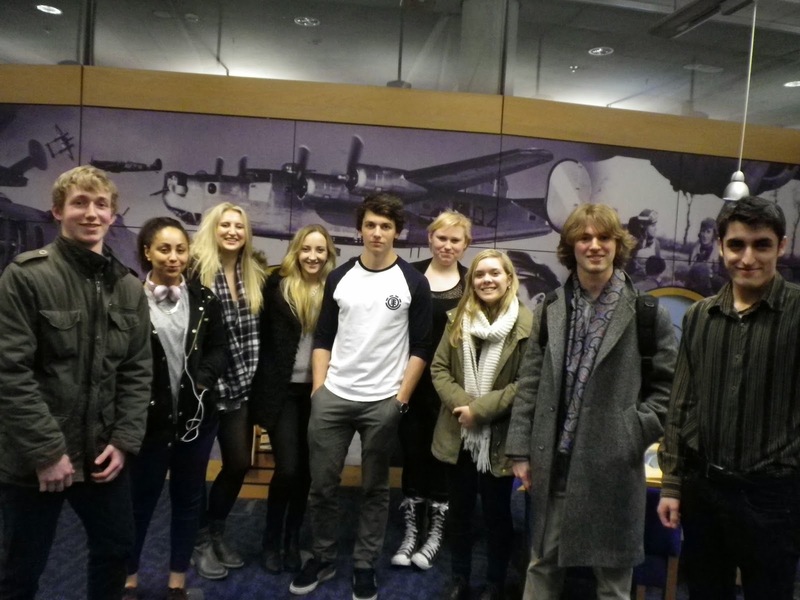 By the end, the two seminar groups, through their research, presentation and discussion had gained a wider understanding of what life may have been like during the Second World War. **Containing Multitudes seminar leader, Becky Avila, who currently serves as the UEA American Scholar for the 2nd Air Division Memorial Library, organized the field trip.